Education, training and staff increases: Many challenges in Infection Control remain to be tackled, concurred representatives of CEE countries at the 3rd CEE Conference on Hospital Hygiene and Patient Safety in Vienna. A specific session was based on a publication on Infection Control which included contributions of national reference centers in the 18 CEE countries. „We are pleased and proud to present contributions of all 18 CEE countries for the first time which discusses the situation of the most relevant topics regarding Infection Prevention“, stressed Bernhard Küenburg, President of the Semmelweis Foundation, in his welcome speech at the 3rd CEE Conference on Hospital Hygiene and Patient Safety which took place on 12 and 13 March 2019 in Vienna. In fact, the status quo in Infection Control in all 18 CEE countries have never been dealt with in one publication before – in the article Control of hospital acquired infections in Central Eastern European countries (supplement of the Wiener Medizinische Wochenschrift, published in February 2019) representatives of the 18 local reference centers for Infection Control described educational requirements and legal challenges in their countries. On the second day of our biannual conference, a session with five Infection Control experts was held. They had also contributed to the publication: Under the lead of Prof. Elisabeth Presterl (Head of the Department of Infection Control and Hospital Epidemiology at the Medical University of Vienna) specialists from Latvia, Slovenia, Kosovo, Serbia and the Czech Republic provided insights into their daily routine in hospitals. 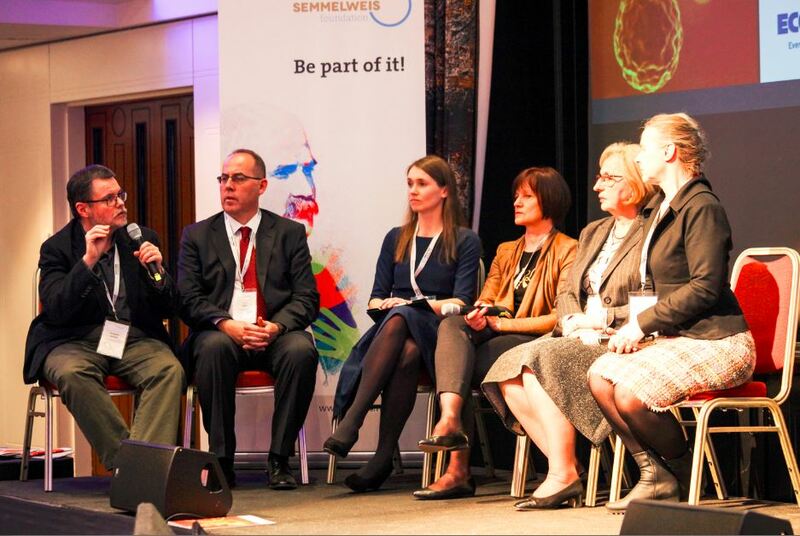 “Many things have already been achieved, but the focus of the session lies on the many challenges, that have to be tackled – especially in the fields of education, training and staff increase”, was the joint opinion of the five experts on the panel. Kate Vulane, public health analyst at the Centre for Disease Prevention and Control of Latvia deplores the lack of qualified specialists with relevant core competences in infection control. The curricula of doctors and nurses do not include enough information regarding surveillance, infection control and antimicrobial stewardship. Ljiljana Markovic-Denic from the Institute of Epidemiology in Belgrade, Serbia, regrets that no common guidelines have yet been set up the number of IC doctors and IC nurses per number of patient beds, and Viktorija Tomic from the National Committee for Infection Control and Prevention in Slovenia is referring to the fact, that no HAI surveillance system has been implemented in her country yet. Read more about the challenges in the 18 CEE countries in the supplement of the Wiener Medizinische Wochenschrift.